September news: the new Preference center, invisible reCAPTCHA in forms, and two-factor access authentication: three new additions to make operations on the platform secure and compliant while respecting user data. An eye to innovative marketing functions, as well as an eye to the security your MailUp activities require. This is the dual motive that has guided all our product development for years, well before the fateful date of the GDPR was ever mentioned. In fact, the new elements we are presenting today concern the second aspect: security, with the aim of making every operation on the MailUp platform secure, protected, and 100% GDPR compliant. More specifically: spam-proof, abuse-proof, and with the utmost respect for potentially sensitive data. So, what’s new on the platform? Let’s take a look. We’ve already mentioned the Preference center in a recent blog post, where we explored a set of tools that often remains shadowed by the major functions. It is a MailUp platform panel that functions like a webpage once it’s activated, where your contacts can land to complete and update their profile independently and at any time. 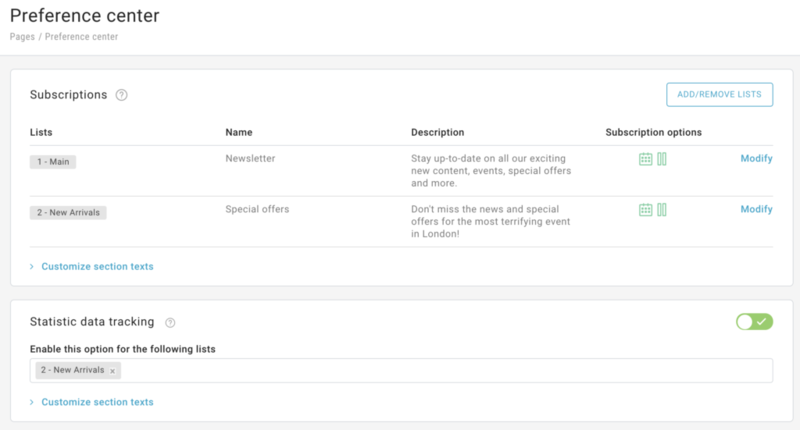 More simply put, this is the tool for self-profiling contacts: when they land here, your customers can update their data, preferences, interests, sending frequency, and types of emails they are registered for. And it has not only gotten a visual makeover, it also has new features: in addition to being fast and easy to configure, the Preference center lets you fully customize the descriptions of the various fields for a highly tailored user experience. As anticipated, it is not just a question of restyling. All the new aspects of this release have a common denominator: updating certain features to make them GDPR compliant. 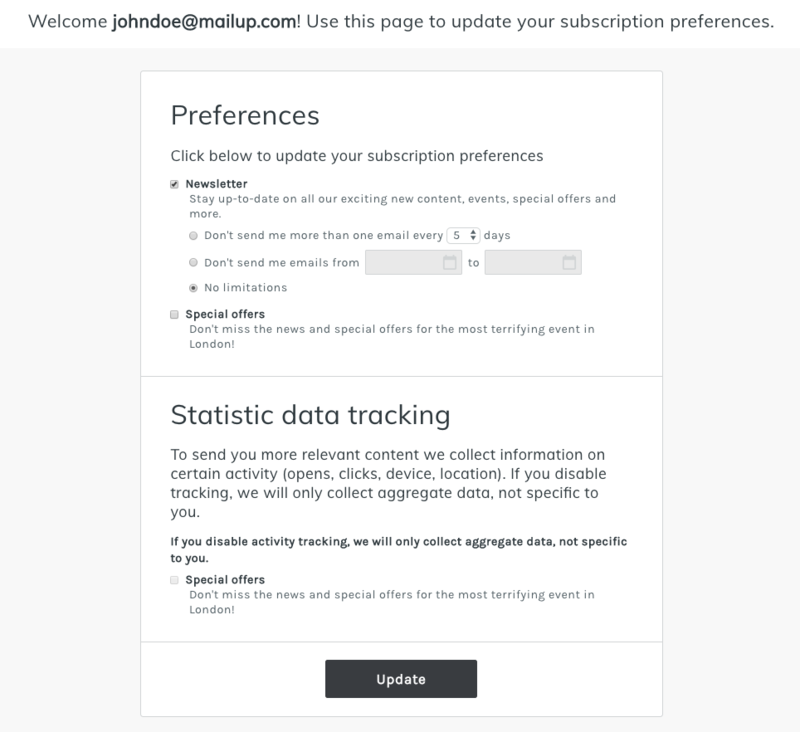 This is why the new Preference center has an option for your recipients to download and export all or some of the data saved in your MailUp platform. Let us show you where your recipients can find the option (with attached link) for downloading the data in an excel file. It is located exactly at the bottom of the page. 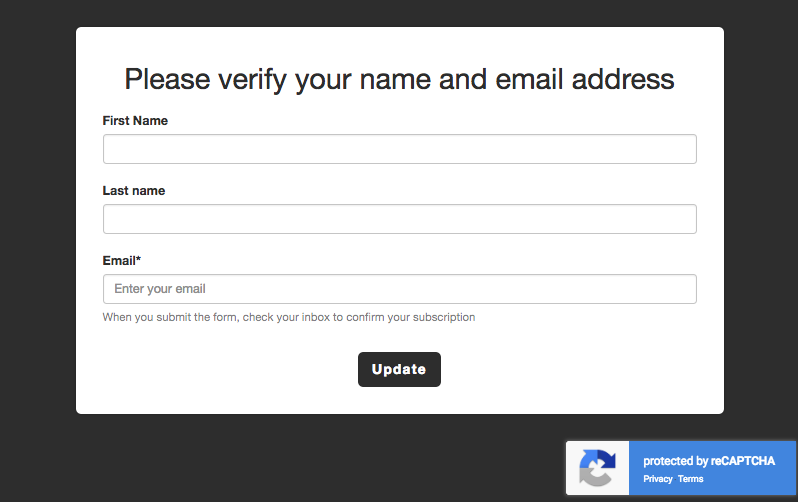 Did you notice that a reCAPTCHA appears in the form above, next to the call to action button? This is the second innovation on the platform: we have introduced a function that activates and inserts the invisible reCAPTCHA service in registration and profile update forms, letting you protect your website from spam and any other type of third-party abuse. Why invisible? 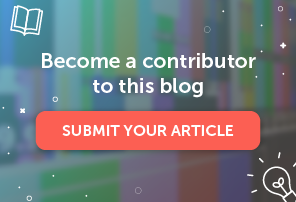 You may already know, but it is an evolution of the CAPTCHA – which involves typing text and numbers – and reCAPTCHA, which instead asks for a simple click in a box that allows Google to verify that the user “is not a robot”, but a real person. The invisible reCAPTCHA was introduced in 2017: it can identify a human being using a combination of machine learning and artificial intelligence. 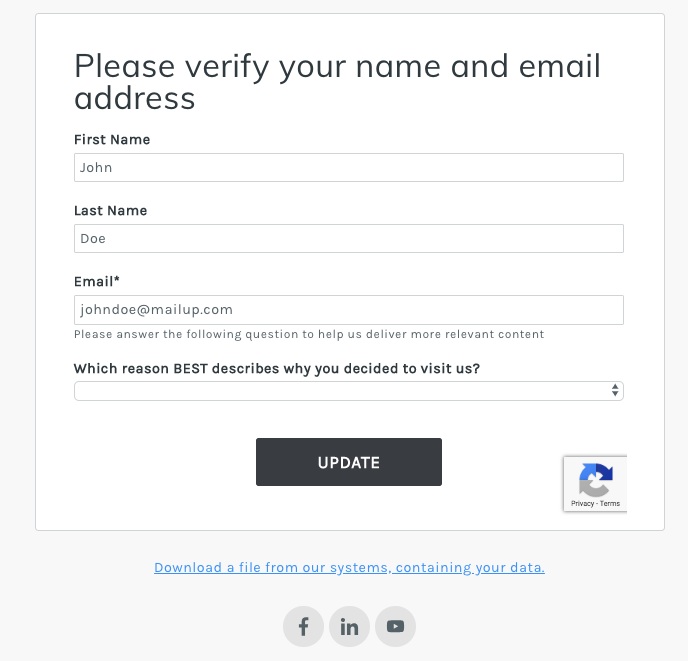 The introduction of the invisible reCAPTCHA in MailUp is an important protective measure we offer our customers, allowing them to also build a wall against spam and abuse in touchpoints such as registration and self-profiling forms. The latest novelty of this release focuses on a security measure for access to the platform. Starting today, you can activate two-factor authentication using Google Authenticator or a similar app, such as Authy. Well-known with the acronym 2FA, two-factor authentication adds an additional level of security to the MailUp access process, preventing any unauthorized access to the platform. Consequently, all the data stored inside it can be protected, which can affect your company (strategies, programs, objectives) as well as your customers (addresses, numbers, personal information). 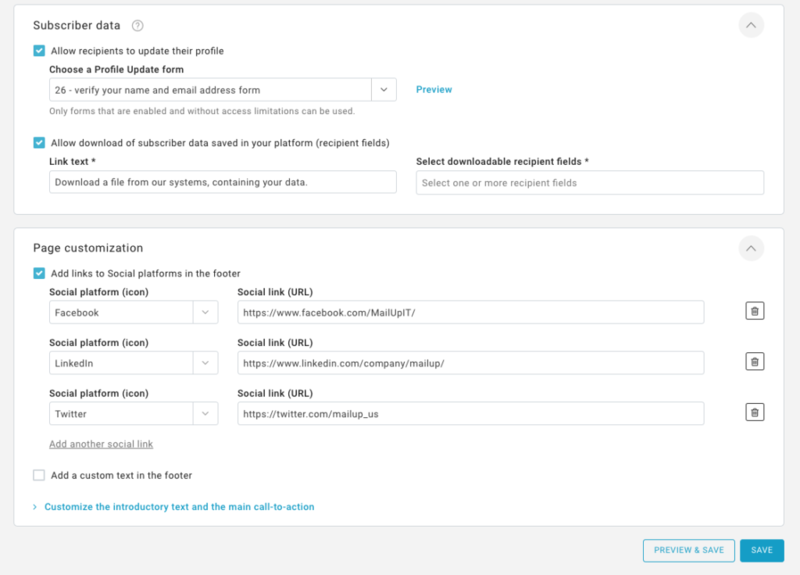 The person responsible for managing MailUp platform permissions within your company can go to the Password management panel to enable or disable authentication for all users or only for some. Here is the exact path: Settings > Advanced settings > User permissions > Password management. When the user logs in for the first time after user-level authentication is enabled, a QR code will be shown for connecting a device via Google Authenticator. After connecting, you will need to enter the numeric code generated by the authenticator, in addition to the username and password. The new aspects of this release were not only necessary for enriching the platform with new marketing functions, but also with the best security requirements. The goal? To make all your operations related to the MailUp platform secure, protected, and 100% GDPR compliant. 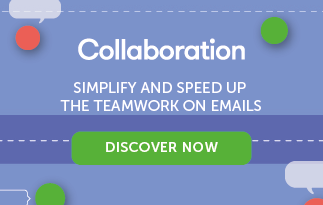 If you still haven’t tried MailUp yet, this is the perfect time to try it, commitment-free. Start now, you can request a free 30-day trial today.